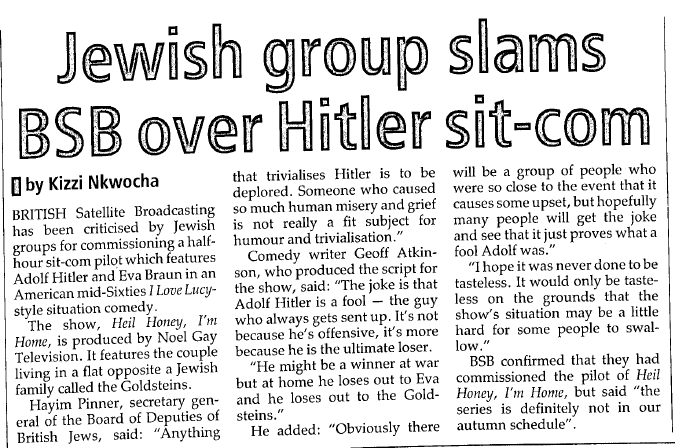 There exists a sitcom about Adolf Hitler and Eva Braun living next door to Jewish stereotypes. It’s called Heil Honey I’m Home! It’s set in 1938. The premise is that Adolf — attempting to appeal to the common man — moves into a small apartment in Berlin. He’s shocked to discover his neighbors are the Goldensteins — a nosy Jewish couple. Hijinks ensue. Heil Honey I’m Home! was broadcast by the then young British Satellite Broadcasting Company in 1990 on its Galaxy comedy station. Jewish groups such as the Board of Deputies of British Jews protested and Galaxy pulled the program after just one episode. BSBC had completed eight episodes, but no one outside of the production team has ever seen them. “The joke is that Adolf Hitler is a fool … the ultimate loser,” Geoff Atkinson told a newspaper back when the show aired. Atkinson created the show and wrote many of the scripts. For years he’s defended his sitcom. Atkinson mentions The Producers as an inspiration. Which makes sense. That 1969 comedy involves two scummy theater producers putting on a musical about Hitler. The comedy won writer and director Mel Brooks an Oscar for best original screenplay. It’s easy to imagine that Atkinson thought he was telling a similar joke with Heil Honey I’m Home! The problem is that The Producers is explicit in its mocking of Hitler. The musical comedy portrayed Hitler as a hippy-dippy dope fiend, cavorting on stage to show-tunes. It’s hard to misinterpret the joke. Sitcoms succeed because audiences identify with the characters. Audiences see a little of their friends and neighbors in the characters. Casting Adolf Hitler as the lead in a Honeymooners-style sitcom asks viewers to identify with him. The show’s concept requires audiences to accept that Hitler is normal. That he could be your neighbor. No one wants to imagine themselves sharing a beer with Hitler. Which is a shame. There’s a lot to like in Heil Honey I’m Home! The pilot episode is the classic dinner-with-the-boss setup. A plot line American audiences have seen in every single sitcom from Father Knows Best to Family Guy. Only in Heil Honey I’m Home! the “boss” is Neville Chamberlain. Adolf wants to make sure the British prime minister isn’t wise to the weapons he’s hiding. He’s hoping his image as a boring family man in suburban Berlin will convince Chamberlain he’s not power-mad. Wackiness ensues when the Godlensteins crash the dinner after learning the most important man in England will be eating next door. This would all be boring if not for the fact that the principles are Hitler and Chamberlain. Show creator Atkinson now works for Vera Productions, a successful British production studio. Buried in Vera’s Website is an oddity — the show bible for Heil Honey I’m Home! This little corner of the Vera Website hosts the definitive database on a television show many deemed too offensive for public consumption. You can read unused scripts, browse pitches for late-season episodes and learn the story behind the theme song. All of these documents paint a picture of what might have been a peculiar, unique and hilarious television experience. If only it hadn’t starred Adolf Hitler. The show’s performances are incredible. The four British actors comprising the principal cast channel with perfect precision the American sitcom archetypes they’re mocking. Neil McCaul as Hitler really stands out. McCaul was a Briton portraying Hitler by way of Jackie Gleason’s Ralph Kramden. It works. He’s hilarious. Gareth Marks as the wacky neighbor Arny Goldenstein shines, as well. A showreel of Marks’ performance — posted below — holds a rare four minutes from the unaired episodes of Heil Honey I’m Home! The extra scripts, show notes and clips reinforce the idea that this show could have been something incredible. One script opens with Eva and Adolf arguing about money. She’s just bought a dress that he insists they can’t afford. “It looks like a million marks,” Eva says. “Yeah well, that’s your fault for not getting inflation under control,” Eva snaps back. A similar television show would make it on the air in America a decade later. Trey Parker and Matt Stone — the guys behind South Park — created That’s My Bush! in early 2001. That’s My Bush! is remarkably similar to Heil Honey I’m Home. Both are ridiculous satires of American sitcom tropes in which the buffoon patriarch character is also an ultra-powerful world leader. Both courted controversy. The first episode of That’s My Bush! climaxed with a naked Laura Bush rolling on the ground while an aborted fetus rides the family dog. Later — after George promises to one day punch the first lady in the face — George and Laura fool around while the aforementioned fetus molests the First Lady. And that’s just the first episode. Heil Honey I’m Home seems practically tasteful by comparison.